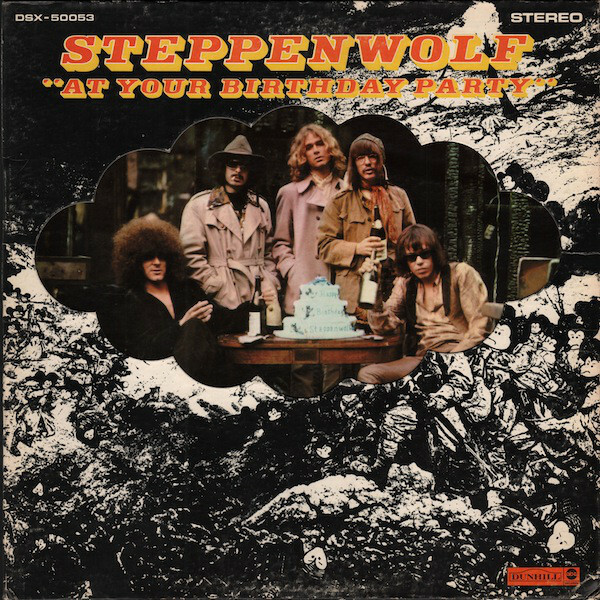 Released only five months after its predecessor, Steppenwolf’s “At Your Birthday Party” their third LP, is an important part of the band’s ABC/Dunhill catalog for several reasons. 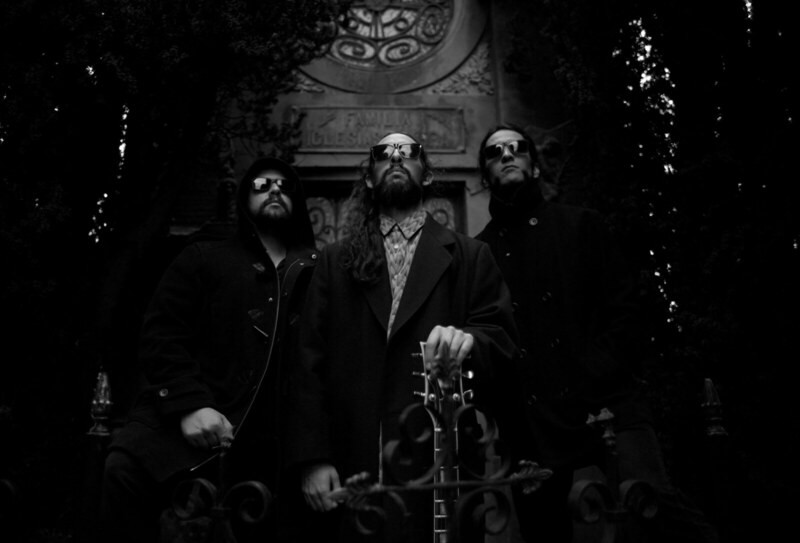 The album segued the transition of the band’s sound from psychedelic to harder-edged rock, was the last album with Michael Monarch as lead guitarist and marked the return of bassist Nick St. Nicholas, who had been an original member of the band, but exited before the recording of their debut s/t LP. Confusingly, St. Nicholas contributed bass to Steppenwolf’s fourth album, “Early Steppenwolf,” actually an album by the pre-Steppenwolf band, The Sparrow, released four months after “At Your Birthday Party” but recorded live in May, 1967, considerably in advance of the band’s debut. Further, “At Your Birthday Party” is much less a John Kay oriented collection of songs, the vocalist having writing credits on only four of the thirteen tracks included, the same number credited to lead guitarist Michael Monarch and producer Gabriel Mekler. The album contains considerably less social commentary than its predecessors, a fact that did not escape fans of the band or music critics. 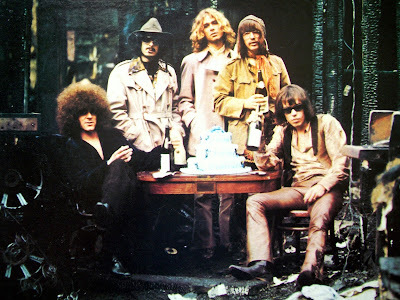 “At Your Birthday Party” was Steppenwolf’s third and final Top 10 album, making #7 on Billboard’s album charts and also contained their third and final Top 10 single, John Kay’s “Rock Me” which peaked at #10 on the charts upon its release in February, just prior to the album’s arrival in record shops. Side one opens with producer Mekler’s “Don’t Cry” a nice rocker, featuring a guitar intro by Monarch, growling vocals by Kay, and swirling organ from McJohn. Along the way Monarch contributes some fine fuzz guitar and a tasteful solo, with a spoken section by then popular deejay Wolfman Jack added for good measure. A rather uptempo number, Monarch’s chugging guitar and McJohn’s Hammond organ run through Leslie cabinets give the song the signature Steppenwolf treatment. Kay and Monarch’s “Chicken Wolf” is much more than a mere nod to blues legend Howlin’ Wolf and his lead guitarist, Hubert Sumlin. The tune bears a distinct resemblance to the Howlin’Wolf/Willie Dixon blues classic “Howlin’ For My Darlin’” part of Steppenwolf’s early live repertoire, and one of six tracks included on “Early Steppenwolf.” Kay’s vocals are most apt and Monarch’s guitar indeed mimics Sumlin’s distinctive sound to a “T.” McJohn’s piano and organ give the tune its full sound and add most nuanced texture, making this a wonderful example of the band’s blues roots. Mekler’s “Lovely Meter” is a delicate number, McJohn’s gentle piano and Monarch’s acoustic guitar are joined by tambourine and tastefully restrained organ, making for a truly a gorgeous, good time music instrumental. Monarch’s “Round And Down” is an interesting blend of restrained, chugging, echoed country influenced rock guitar by Monarch and Edmonton’s driving drums. A mid-tune instrumental break is the highlight featuring a simple, tasteful lead guitar line. The Kay/St. Nicholas penned “It’s Never Too Late” was the a-side of a May, 1969 single that reached only #51 on the charts, but deserved much better. McJohn’s swirling organ and piano intro give way to Kay’s gentle vocals, and the lyrics are a wonderful example of the hopeful, peace and love ethos of 1960s rock, “It’s never too late to start all over again, to love the people you caused the pain, and help them learn your name, oh, no, it’s never too late to start all over again.” The song exudes the influence St. Nicholas brought with him from the California based band, T.I.M.E. (Trust In Men Everywhere) which recorded two albums, and included future Steppenwolf lead guitarist Larry Byrom, among its members. Side one closes with the short, aptly titled St. Nicholas tune “Sleeping Dreaming” a gentle, just over one minute, instrumental. 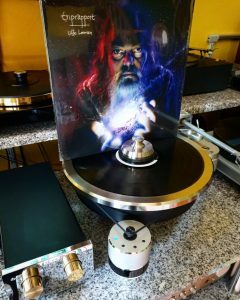 “Jupiter’s Child” penned by Edmonton, Kay and Monarch opens side two, and is a return to Steppenwolf at its psychedelic best. An edited version of the song was released as the b-side to the album’s hit single “Rock Me.” Monarch’s guitar soars and Kay’s lyrics fit the melody perfectly, “Wish I knew the way back to where you came, gladly would I leave here, take another name.” McJohn’s organ joins Monarch’s guitar as Kay continues “I can tell by you, it must be true, it’s up on Jupiter’s face, they don’t embrace our own disgrace, somebody, help me off this place.” I think this song would have made a great a-side in its own right, but hindsight is always 20/20. The Edmonton/Mekler “She’ll Be Better” is a five and a half minute change of pace, the song’s topic being simple, raw emotion. From its opening “you’ve got to pick, pick out a song, it’s an easy way to right the wrong” to “if you don’t say, if you don’t say what’s in your heart, there’s no better way for fallin’ apart” the song conveys the power of music in communication. Musically, the tune is psychedelic led by Monarch’s soaring guitar and McJohn’s swirling organ. “Cat Killer” credited to McJohn under his birth name John Goadsby, is a short, minute and a half instrumental take featuring pounding piano and gentle organ. John Kay’s “Rock Me” was not only a #10 hit when released as a pre-LP single, but also a harbinger of the band’s move from psychedelic to a more blues-based hard rock sound. Rather than social commentary, Kay’s lyrics are introspective, representative of the angst of relationships, “Don’t know where we come from, don’t know where we’re going to, but if all of this should have a reason, we would be the last to know.” Hard rocking at beginning and end, the tune has a mid-tune relaxed feel with Monarch’s guitar, McJohn’s organ and Edmonton’s drums settling into a gentle, accessible groove. Monarch’s four minute “God Fearing Man” is a mid-tempo tune, rather atypical of the Steppenwolf catalog, but is the lead guitarist’s introspective take on the the human condition, “he’s a God fearing man, yes he does all that he can, to try and understand, what’s wrong with his fellow men?” The Edmonton/McJohn/Monarch “Mango Juice” is a gentle, three minute instrumental featuring nicely echoed piano by McJohn with flute added, giving the song a unique place in the band’s repertoire. 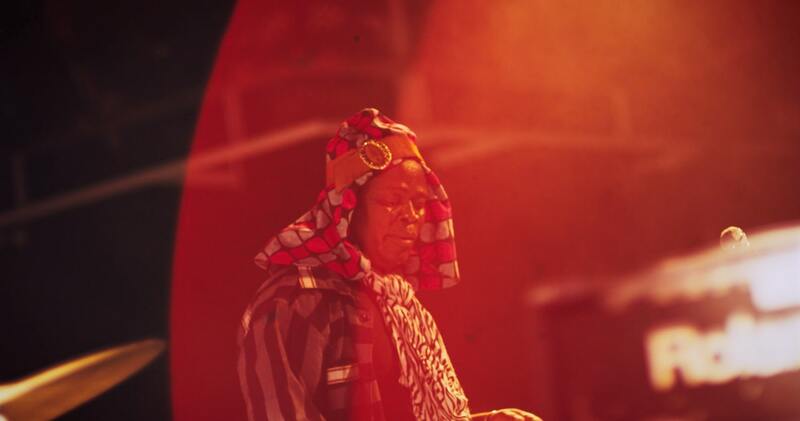 The album closer, producer Mekler’s “Happy Birthday” is another gentle number, with McJohn’s organ and Monarch’s guitar restrained, as are Kay’s vocals. The song includes female backing vocals, making it another unique piece of the band’s catalog, and on this mellow note “At Your Birthday Party” comes to a close. As previously mentioned “At Your Birthday Party” serves as a turning point in Steppenwolf’s catalog, with elements of psychedelic rock remaining but joined by hints of the harder edged rock that followed. The biting social commentary of the band’s first two albums is not to be found here, although it would return later with the band’s fourth studio LP “Monster” which will be reviewed in the future. Changes in band personnel, especially in the lead and bass guitar positions, would be a constant over the remainder of Steppenwolf’s time at ABC/Dunhill, and there would be no more Top 10 albums or singles, but there was much more incredible music to follow. For the moment, however, Steppenwolf would become rather frozen in time, as its next release “Early Steppenwolf” would contain live recordings by The Sparrow, the pre-Steppenwolf band which included St. Nicholas on bass and Mars Bonfire (Dennis Edmonton) on lead guitar, and act as a temporary break in the action, while John Kay worked on material for the band’s next studio album, “Monster” which would hit record stores in November, 1969, only four months after “Early.” However, that is getting ahead of the story. Next up is Chapter Four of The Steppenwolf Story, “Early Steppenwolf” which will follow soon. I hadn't realized it had come out so soon after Second! That might explain why it doesn't work quite as well for me as the two albums that preceded it or Monster, which felt like a return to form (despite the poor reviews of the time). I suppose it might simply be that I prefer Kay's lyrics/songs. That said, still an excellent album by a great band! Fine review. It's amazing how prolific the bands of the time were and how they were still able to come up with quality material. I believe this is Steppenwolf's heaviest album. The guitars are fat and toneful. The lead guitar sound in Don't cry is incredibly heavy. The bass guitar is prominent and great drumming throughout.